Mobile phones everywhere and no (free) public wi-fi! No public wi-fi? For shame! For shame! Last week, I wrote a post about how annoying it is to attend a ‘digital’ function, where there is no public wi-fi to jump on. Equally frustrating is when you attend a function, where the conveners publish their Twitter handles or event hashtags, but leave attendees to their own devices to wade their way through spotty and/or inaccessible cellular signals to post updates to their social media accounts. “Sitting at the Bands and Fans panel hosted by CMJ at Social Media Week and I’m pissed! Why? You ask. Because there’s no wifi! WTF!? How can we be sitting talking about the value of Tweeting and staying connected, when there is no f*#king internet connection?! I’m just saying. AT&T’s network is crap and I can’t flex on my iPad the way I had intended! Twitter feels like swimming through molasses. I am ashamed to be a part of this right now. Ashamed. Red Bull Space – you should have shame too! All this great info from J Sider, Marni Wandner, Robbie Mackey and Ariel Hyatt and no wifi! Needless to say, almost two years later and not much has changed. 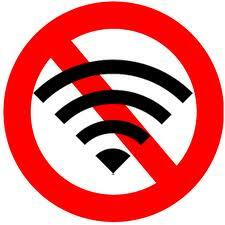 Businesses have not adopted offering free wi-fi as a standard. Even if (as my good friend Rob Underwood noted in my rant last week about the NYC DMC event) the reason for a private wi-fi or an unpublished password is security, when you host one of these functions, setting up a temporary wi-fi network and/or password is a sensible thing to do. With municipalities across the country looking at implementing free public wi-fi, shouldn’t businesses, retail establishments, cafes, bars and restaurants also look to do the same thing? How many of we entrepreneurs select meeting spots bases on the availability of wi-fi? Or perhaps, rather, wi-fi is a really important element towards achieving a broader network of connected users and devices. Whatever the case for adopting a free wi-fi solution may be, know that if I’m coming to an event, and it’s not popping, I’m putting you on full blast!